Kim Caldwell of Artistic Bliss Designs commemorates her 5th year of hosting exciting themed art events on the gorgeous Southern California West Coast with another blissful retreat, An Affaire at Tiffany's. The famed Hollywood film, Breakfast at Tiffany's, just on the heels of its 50th Anniversary couldn't be a more fabulous way to celebrate. Experience the epitome of Tiffany's class and Audrey's iconic style with the creative artistry of Jeanne Oliver, Kecia Deveney, Laura McCollough and Lonnie Jenck; the musings and wisdom of Carol Spinski of Raised in Cotton; the photographic splendor of Tiffany Kirchner Dixon of The Fancy Farmgirl; an exclusive book signing with Jenny Doh of Crescendoh; and a mini-project with Amy Tangerine and American Crafts. Grab your favorite black dress, pearls and sunglasses and prepare to luxuriate in everything Audrey! Our creative retreat begins with a festive Welcome Night and Vendor Soiree on Thursday Evening. Wear your favorite black dress and take window shopping to the next level. Sip a delicious libation, nibble on an appetizer and step inside our own Tiffany's store with over 14 local and regional artists who will share their creations for purchase. Indulge your inner Audrey and Strike a Pose with Tiffany! Tiffany Kirchner Dixon of The Fancy Farmgirl will join us to photograph you and your friends doing it up Audrey Style in our fabulous Tiffany's photo booth. After our weekend is over, relive all the moments and enjoy free downloads of hundreds of exclusive Tiffany's pictures taken by our talented photographer. Hold a little blue box, tip your Manhattan sunglasses, flare out your hips and say "Oh golly gee damn!" Tiffany Kirchner Dixon is a commercial editorial photographer who has worked with several national publications. She is a self proclaimed "fancy farmgirl" and loves everything about country life and all it has to offer. Her farmgirl style comes across in her whimsical lifestyle photography, each click of the shutter tells a fanciful story. You can visit her to see more of her work at www.thefancyfarmgirl.com and www.thefancyfarmgirlphotography.com. As if the evening couldn't be more exciting, Jenny Doh of Crescendoh will join us for an exclusive book signing of her latest publication, Creative Pilgrimage. A true style icon, Jenny shares a love for fashion and cultivating gratitude that Audrey herself would admire. Jenny Doh is Founder of www.crescendoh.com ~ like a magazine but daily like a newspaper, featuring fresh and creative content from artists within all genres, coupled with their stories that highlight the power of art in our lives. Jenny serves regularly as keynote speaker across the nation to deliver messages related to creative passion, leadership, communication, and compassion. Jenny and her husband raise their two children, Monica and Andrew, in Santa Ana, California. She loves to knit, stay fit, and volunteer for her alma mater, UC Irvine. To learn more, visit www.crescendoh.com. Our creative journey will continue on Friday and Saturday with two full days of art classes and lovely luncheons. Swoon in our Tiffany designed classroom, wear your comfy clothes, learn new artistic techniques and create four Audrey inspired treasures. Enjoy Affaire style reserved seating with your friends and the option of continuing your crafting after hours. Jeanne Oliver grew up watching old movies and was inspired by the styles and femininity of the past. Nothing seemed more glamorous to her than Vivien Leigh sweeping down a staircase, Grace Kelly wearing white gloves with a black cocktail dress or Audrey Hepburn outside of Tiffany's. Hours were spent designing her own creations and dreaming of wearing all the apparel her fingers could sketch. Today Jeanne has the honor of offering collections of her clothing, bags, art, jewelry and vintage pieces that tell a story. It is such a privilege to be a stay at home mom and also have the opportunities to create, teach and sell her creations. She is just a girl that finally started listening to the creative whispers that had been there all along. Won't you join her! Originally from California, Kecia Deveney is a mixed media, jewelry artist and instructor who now resides at the Jersey Shore. Drawing inspiration form her life experiences as the mother of a severely disabled child, she channels that energy into learning and creating art. Her love for experimenting with “reclaimed discardia” results in many unique pieces of storytelling art. She has been teaching at art retreats all around the country and also in her studio for about 5 years now. Her goal as a teacher is to support, motivate and inspire others. Laura McCollough lives in Southern California with her wonderful husband, three beautiful daughters, and an adorable but deaf dog “Lady Scarlet Syrah of Glenwood”. She has been scrapbooking since she was a little girl and truly has a passion for this art form! Laura loves to create, design and teach others about this wonderful craft! Laura went to college for Interior Design and also spent some time planning weddings so she loves how scrapbooking has blended together perfectly with mixed mediums and home decor. Making projects for her home is really where she loves to play and experiment. Laura has taught classes for the last six years and also owns a kit club, A Kiss on the Chic, where she sells project based kits. Laura loves to travel, sing, cook, play tennis and spend time with her family and friends. She feels so blessed to be doing what she loves for a living and tries to enjoy every moment the Lord has given her! Laura is continually inspired by so much that life has to offer and can't wait to see where the journey will lead next! Lonnie Jenck was born and raised in a small farming community on the Oregon Coast. Since a very young age, she has been creating artwork to share with others. As a mother of six and an ever growing extended family, she is blessed to enjoy her love and passion of creating art with all things old, tattered and worn. Lonnie talents are as both a jewelry and mixed media artist, but she has found her true passion to be jewelry making. She loves to share her creations teaching at inspiring art events and at home in her studio and has been published in many jewelry publications and local magazines. After a dinner break on your own, we will be gathering once again on Friday evening for what is often the most favorite part of the retreats ~ the art exchanges. Enjoy delicious desserts while we support each other's artistic talents which are sure to take your breath away. Whether you decide to jump in and create a treasure or be a spectator, this evening of artistic bonding is certain to inspire. 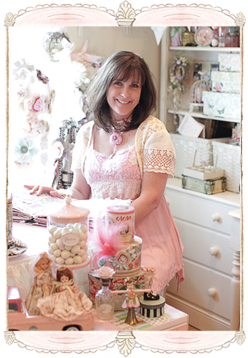 Join Amy Tangerine and American Crafts this evening as well for a special mini-project featuring her new scrapbooking release coming in January 2012 at CHA in Anaheim! Amy's art of "truly living" and collaborating with other creative people will surely shine in this charming project. Born and raised in Chicago, Amy spent much of her childhood wallpapering her bedroom walls with the colorful and glamorous pages of fashion magazines. She learned how to sew her senior year of high school and what developed was her first passion: designing. Within five years, she had become an award-winning designer and founder of the popular handcrafted t-shirt line Amy Tangerine. Her collections were featured in hundreds of retail outlets, including Bloomingdale's, Neiman Marcus and Barneys New York, and yielded impressive worldwide sales. In 2007, her business expanded to include scrapbooking, with her fashion design work now being produced on a custom basis. Her love for sharing her clothing and now also paper crafts has taken her all over the globe and given her the opportunity to teach creative classes from Hawaii to Tennessee. Our Saturday luncheon will be a sit down affaire as we join editorial stylist and photographer, Carol Spinski of Raised In Cotton, for an intimate and interactive forum discussing her latest venture, Good Stella. Learn firsthand what this wonderful virtual sisterhood of caring, inspiration and support is doing for anyone with a Dream, Desire or Passion. Growing up on her family's farm in Arkansas, Carol Spinski learned the beautiful art of arranging every day elements to enhance her surroundings. A talent for design assembly was forged from those early childhood experiences on the family farm which echoes in the work she does today. Carol’s career path as a Photographer and Editorial Stylist has been a natural progression that has allowed her to share her inspiration with others. She is the Co-owner of Raised In Cotton, a business featuring vintage prop rentals, event production and decor in a century old farmhouse just outside of Kansas City, Missouri. Carol’s signature style is romantically atmospheric, multilayered and textural, flavored with the vintage aesthetic she adores. She and her work have been featured in Artful Blogging, Somerset Life, Romantic Country Magazine, Romantic Homes Magazine, Better Homes & Gardens and 2010 Somerset Life Calendars. Most recently the circa 1865 farmhouse that she and her husband decorated and renovated was featured in the book Romantic Prairie Style. Carol is especially devoted to helping mentor Women that aspire to achieve their own creative dreams. In 2011 she established GoodStella.com a website that is a gathering of kindred spirited creatives who use their collective voices to inspire each other. Her hope for the Good Stella community is that everyone will forever Dream * Create * Shine and in doing so will reach for the stars! Prepare to say our goodbye's and gather once again on Saturday evening for a festive pajama party and screening of our theme film, Breakfast at Tiffany's. Come dressed in your favorite pajama's, fuzzy slippers, participate in an altered sleep mask swap and munch on a box of Cracker Jacks. Let's cuddle girl style for this last magical evening together! ~ Fabulous goodie bags filled to the brim, atmosphere galore, friendship, laughter and so much more. . .
We return to the famed boutique hot spot, The Belamar Hotel, located in the hip enclave of Manhattan Beach, California for our Tiffany's Affaire. The Belamar Hotel embodies LA's glam decor, funky vibe and unique style. Located just minutes from the Los Angeles International Airport, it is the perfect intimate location for our all girl get-away. Tiffany's attendees will have the benefit of a discounted room rate of $135.00 per night which includes complimentary wireless Internet access, the Adrenaline fitness center, outdoor heated pool and jacuzzi, free beachcruiser rentals, a DVD movie library and sundry shop. The Belamar is an 100% smoke-free environment. We encourage you to make your reservations right away. You will receive a discount code and information upon registration. Join us for a lovely day of antiquing along the Southern California coastline and visit some of the best shopping spots from Orange County to San Diego. Travel by luxury motor coach complete with leather seats, air-conditioning and wireless internet. Enjoy exclusive receptions, goodies and bargains planned just for our Tiffany's bus excursion at these famed locales ~ The Groves Antique Market, home to over 200 vendors and named Orange County's 2010 Best Flea Market, Linda Carpenter & Linda Curry's over 10,000 Sq Ft antique warehouse, Urban Barn in Escondido, and Lori Chandler's ode to the alluring grandeur of Old Paris, Vignette's Antiques located in the San Diego's largest antique district, Ocean Beach Antique District. You won't want to miss this incredible day of touring! Registration for this tour is optional and must be purchased on the Website once registration begins on November 6th. Registration payments, deposits and fees for this event are pre-paid and non-refundable. Ohhh, I can't wait!!! When I saw this on FB I thought OMG is registratin open today?! what a cool way to celebrate my birthday, LOL, I'll have to be patient until November 6th! Kim, I would love to come out for your Event, but I have to play it by ear. I have a Grandbaby due the 9th of April, my daughter and her family live in China. I am keeping my fingers crossed they decide to come to the States for the Birth. If so, and there is room I will be signing up! I just know it will be a Beautiful Event!! Love the Audrey theme, Kim! Fun! I hope you can come play with us Heidi! You will love it - promise!! Ugh why must I live so far away? This sounds amazing!